In last post we learned about how to setup a root and non-root bridge. In this post we will see the configuration for multiple VLAN on Root, Non-Root Bridge for wireless clients. Again here I will use WPA2-PSK to authenticate both WLAN. 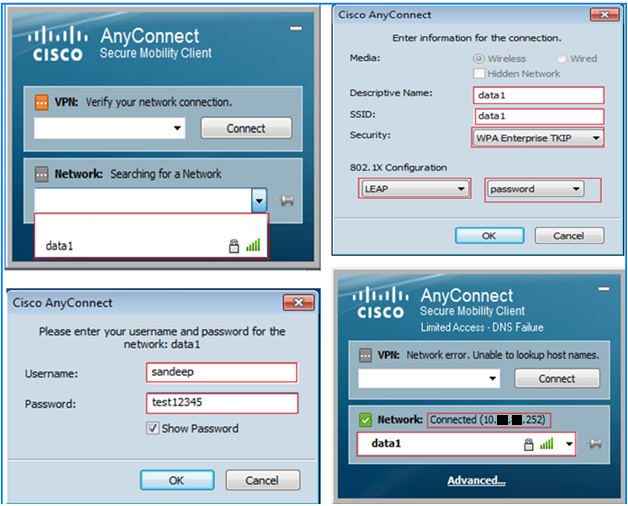 One WLAN for Root-AP to Wireless-Bridge communication and other WLAN for clients to authenticate. That’s all for configuration. Now we are ready to test a client for VLAN 81. 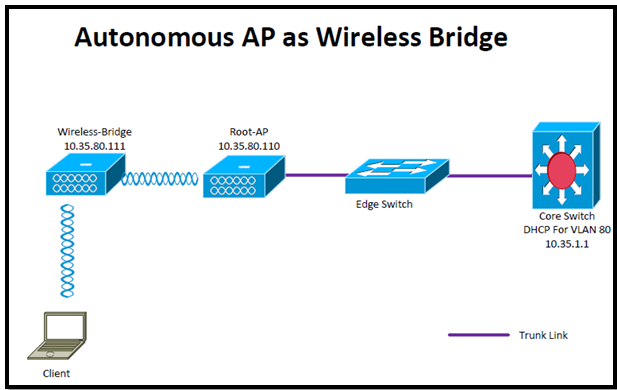 In this post we will learn how to configure AP as wireless bridge. I tried to find the documents on cisco but they are very limited. Let’s learn something about Wireless Bridges. I have two 1240 model APs. A wireless bridge is a Layer 2 device; it connects two or more LANs, which can be in different buildings, through the wireless interface. Wireless bridges provide higher data rates and superior throughput for data-intensive and line of sight applications. Wireless bridges eliminate the need for expensive leased lines and fiber-optic cables and mostly used to connect two sites where either WAN line is not available or available but expensive. In this post I will create a WLAN “RSCCIEW” to connect Root-AP & Wireless-Bridge. It will always connect to Root-AP via Native VLAN. It can support multiple VLAN. (Not like Repeater). Basic Root-AP/Wireless-Bridge Configuration with WPA2 encryption/single SSID. *** If we want to authenticate Wireless-Bridge with LEAP(How to Authenticate with LEAP) or EAP-FAST(How to Authenticate with LEAP) then we have to use the same method as we did for Repeaters. Check my old post to use EAPFAST or LEAP to authenticate Repeater, Wireless Bridge, WGB, and Universal WGB. Lets see the configuration of EAP-FAST authentication. *** In the same way we can authentication Bridge, WGB. In last post we also learned the basic concept and theoretical knowledge of repeater and there usage. In this post we will directly conifgure the Root AP/Repeater AP with LEAP Authentication. Here is the configuration of Root and Repeater AP. authentication open eap eap_method --> also need to add the open EAP for clients which may associate with Repeater AP. In the next post we will learn how to Authenticate Repeater via EAP-FAST. In this post we will learn how to configure a repeater to extend our wireless coverage. To extend or increase the range of our WLAN, we can add a repeater AP to the network. This repeater AP will not physically connected to the WLAN, but is instead added to radio range of the wired connected Access Point and the clients that access the WLAN. ***AP has two radios, only one can be used as a repeater. We must configure the other as a root radio. ***Repeater only can connect to root AP in Autonomous mode. When we configure an AP as a repeater, the access point’s Ethernet port does not forward traffic. *** After our AP is configured as a repeater, it shuts down its Ethernet connection. Any devices connected to the Ethernet port are disconnected from the AP. Of-course we can configure multiple APs as repeaters, but throughput decreases as additional APs are added to the chain, because each repeater must receive/retransmit the packet on the same channel. Because of this, throughput is cut in half for each repeater added. 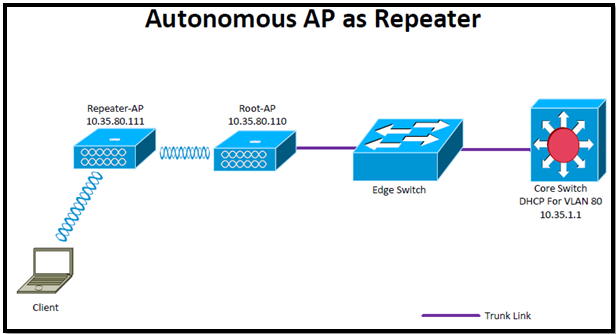 A repeater AP connects to the root AP which has the best connectivity. But we can specify the AP to which the repeater associates. Setting up a static, specific association between a repeater and a root access point improves repeater performance. It’s best to use repeaters to serve clients that do not require high throughput. Cisco AP repeaters work best when clients are Cisco devices. Problems occur when third-party devices try to associate with repeater APs. Ensure the data rates configured on the repeater AP match the data rates of the parent AP. We can’t configure multiple VLANs on repeater access points. Repeater access points support only native VLAN. If Repeater is connected to root AP, which has many BSSIDs and we are adding/deleting SSID on root AP that might change the parent mac address. So if we are making some changes on root AP then we must again check the connectivity between root AP and repeater after modification. Assigns the SSID as an infrastructure SSID. This is the SSID the repeater uses to associate to the root AP. *** The ”optional” argument allows regular clients to associate as well. Establishes this AP’s role as a repeater. We can enter MAC addresses for up to four parents. If the repeater fails to associate to the first parent, it moves to the next on the list. We can enter a timeout, which establishes how long the repeater tries to associate to a parent before it moves to the next. Root AP/Repeater Configuration with WPA2 encryption. If we want fix the repeater to associate to specific root Aps, we can use “Parent <1-4>mac-address [timeout]” command under radio interface of repeater. Maximum 4 parent’s mac addresses are allowed. In our case we have only one Root-AP. Also we can enter a timeout value in seconds that determines how long the repeater attempts to associate to a parent access point before trying the next parent in the list. Timeout value varies from 0 to 65535 seconds. In next post we will see the Repeater authentication via LEAP. In this post we will see, how to configure a standalone AP to act as AUTHENTCATOR SERVER (RADIUS). Standalone AP can be configured as local RADIUS server to provide the AAA service. This kind of solution can be used in small scale deployment or which can not afford to buy ACS or ISE and It can also provide as a backup RADIUS server in case of primary fails. *** EAP-TLS is not supported on Autonomous AP. I will create one SSID”data1” and map to specific VLAN”101”. The local RADIUS server uses UDP ports 1812 and 1813. Keep the config as simple as possible. In this type of scenario, AP is using as Authenticator and Authenticator server (Both). AP can authenticate max 50 client’s devices. AP performs up to 5 authentications per second. When AP acts as Local authenticator, performance may decrease for associated clients. Configure the local AP as NAS (Network Access Server). Create users to authorize to authenticate. Enter the local authenticator as radius server. 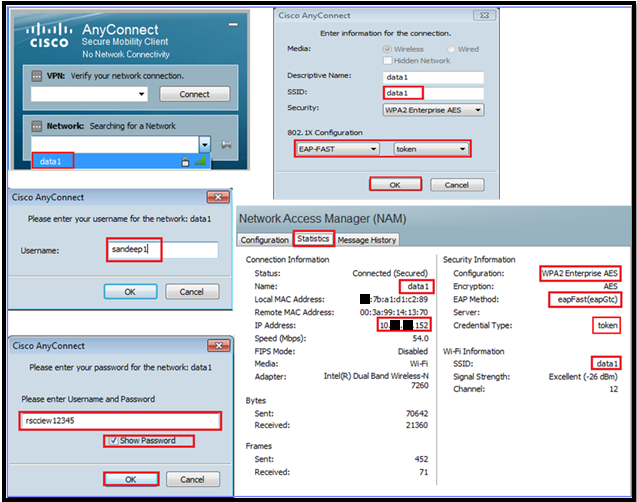 Step7: Configure local users to authenticate as NAS entries. Step8: Configure EAP-FAST Settings (authority ID, Info, server key…Etc.). All EAP-FAST authenticators are identified by an authority identity (AID). The local authenticator sends its AID to an authenticating client, and the client checks its database for a matching AID. If the client does not recognize the AID, it requests a new PAC. The local authenticator uses server keys to encrypt PACs that it generates and to decrypt PACs when authenticating clients. The server maintains two keys, primary key and secondary key, and uses the primary key to encrypt PACs. By default, the server uses a default value as the primary key but does not use a secondary key unless we configure one. When the local authenticator receives a client PAC, it attempts to decrypt the PAC with the primary key. If decryption fails with the primary, the authenticator attempts to decrypt the PAC with the secondary key if one is configured. If decryption fails, the authenticator rejects the PAC as invalid. The local authenticator automatically generates PACs for EAP-FAST clients that request them. However, we might need to generate a PAC manually for some client devices. When we enter the command, the local authenticator generates a PAC file and writes it to the network location that we specify. The user imports the PAC file into the client profile. AP002#radius local-server pac-generate sandeep1 ? Usually we use a external RADIUS server(ACS or ISE) for authentication in big enterprise but in small office it’s not feasible solution because of cost. In this kind of situation, a standalone/autonomous AP can act as a RADIUS server. User are authenticate against the Local database configured in AP. Autonomous AP can authenticate using LEAP, EAP-FAST and MAC based authentication. In this post we will see, how to configure LEAP and local RADIUS server on AP. aaa new-model ->This command reinitializes the authentication, authorization and accounting functions. server 10.35.100.250 auth-port 1812 acct-port 1813  ->A server group for RADIUS is created called "rad_leap" that uses the server at 10.35.100.250 on ports 1812 and 1813.
aaa authentication login local_eap group radius_leap -> Authentication [user validation] is to be done for users in a group called "local_eap" who use server group "radius_leap". In this post we will see the software upgrade on Autonomous AP. Normally upgrade is performed in order to take advantage of the new features or if there bug in old IOS or this is the standard from company side to upgrade to the latest version of IOS on AP…there can be many reason to up-gradation. Step1: Download a new IOS image from cisco.com for respective AP model. Step2: Open TFTP server on a notebook. Step3: Put this new image on TFTP root directory. Do you want to overwrite the old image? Do you want to keep the old image and also want to install new one. ? overwrite option overwrites the software image in flash with the downloaded image. reload option reloads the system after you download the image unless the configuration is changed and not saved. location, specify the IP address of the TFTP server. *** If there not so much space then in between download process a error message will be displayed and it will stop the download. Step7: After download a new IOS, AP will reload or you have to manually reload the AP. Step8: Verify with show version command about the new software version. Step1: Download the new IOS from cisco.com by your CCO id. Step2: Open TFTP server and put the new image in TFTP root directory. Step4: From the software upgrade page, choose TFTP upgrade. Step5: Enter the IP of TFTP server and the image name. We will follow the same procedure as I did for Single SSID on Standalone AP. Today I learnt to create SSID with different authentication in my test LAB on cisco Autonomous AP. SSID are a case sensitive and can contain up to 32 alphanumeric characters. There should be no space in SSID. If there is only one SSID then we must use guest-mode command under SSID. I have a DHCP server config on my Cisco Switch in VLAN 101. Vlan 100 is for management.